Green Bean Casserole is a tradition in the Midwest. Since moving here, I have rarely attended a holiday gathering or buffet where it was not served. 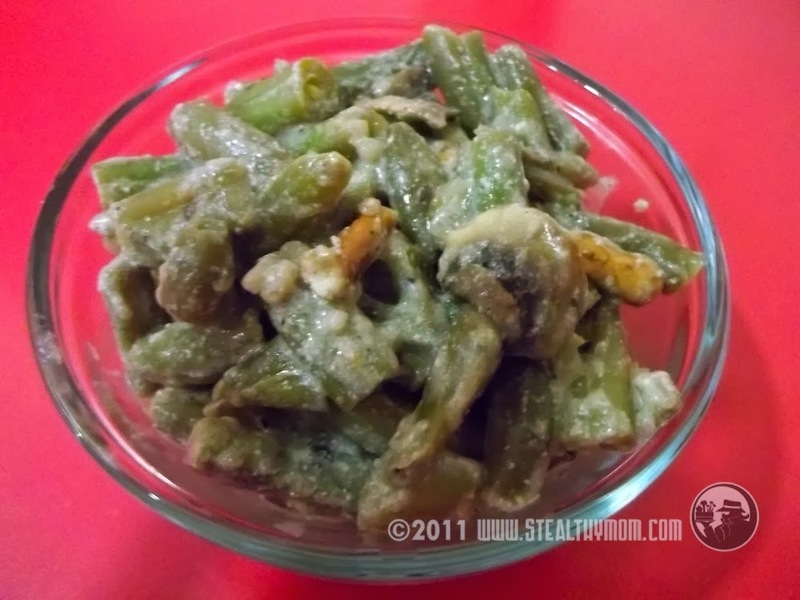 For those of you who have never had it, I will try my best to describe it: creamy green beans, with a hint of mushrooms and onions. Some folks make it mushy with canned green beans; some folks make it firmer with fresh or frozen. Almost without exception, it involves canned mushroom soup and canned, fried onions. Knowing what it is made of, and anticipating a migraine from the monosodium glutamate, I still dig in whenever I see it. Here it is! "Clean" Bean Casserole has no weird ingredients, is simple, and is very close to the original in taste and texture. Remove from the oven. Within the dish, move the beans to one side and tip it so the hot liquid pools at the other end. Whisk the starch into the liquid with a fork. When the starch is totally dissolved, thoroughly re-mix the entire casserole. Let the casserole stand for 10 minutes. Serve. Optional: sprinkle a small handful of pecans or pretzels over top before serving. I shared this recipe on Fight Back Friday and Ultimate Recipe Swap, weekly round-ups of natural food recipes. Yummy! It sounds delicious :) I've never liked the version with the creamed soup, but I bet this one tastes much better!